Add “Support Special Olympics” to Your April Grocery Shopping List! For the sixth consecutive year, Special Olympics Nebraska has been invited to be a beneficiary of an annual customer fundraising promotion with Safeway stores across Western Nebraska. 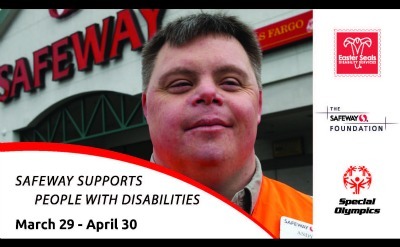 Please visit your neighborhood Safeway store from March 29 – April 30, 2013 and make a donation at checkout to support the People with Disabilities campaign. Funds raised will benefit Special Olympics, Easter Seals and several other smaller disability organizations in local communities, which will allow us to provide greater services and programs for our 5,000 athletes and help us reach the other 35,000 people with intellectual disabilities in Nebraska to bring them into the Special Olympics family. Thanks to the support of Safeway shoppers, the national People with Disabilities campaign has raised more than $9.3 million for Special Olympics since 2008. Nebraska Safeways participating in the event are located in Ogallala, Alliance, Scottsbluff, Sydney and Chadron. Visit http://www.specialolympics.org/Sponsors/Safeway.aspx for more information.